Get ready for spring with new riding gear! ​All clothing now on sale! Giant brand clothing is 40% off. Specialized brand clothing is 75% off. *While supplies last. May not be combined with other discounts. ​Gift Certificates are available in any amount. Purchase any bike and receive 20% off a helmet or 25% a pair of shoes. Some restrictions do apply. Come in and take a look at some of the closeouts we have available at a great price! 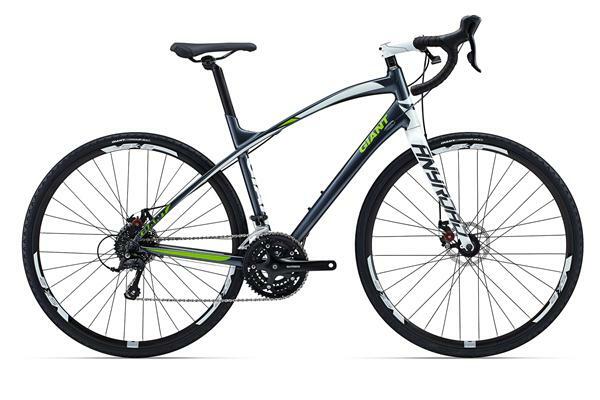 The New ANYROAD from Giant! A new way to discover adventure and fitness. Designed for versatility and comfort, ANYROAD IS AN INVITATION. Stop in and test ride one today! What is your style of riding... City, Commuting, Trail, Race, Off-road, Mountain, Recreation... We have a wide selection to fit your needs. Used Road and Triathlon bikes! Stop in for a test ride today. Gear-n-Up is a family owned business that is conveniently located off Hwy I-41, and connects to the CB trail. We are a proud retailer of the world's largest bike manufacturer Giant Bicycles. We also carry other brands such as Reid and Biria, along with used trade in bikes that have been tuned up by our staff, and are road ready. Our team of mechanics can repair almost all makes and models of bicycles. Our mission is to help every rider find a bike that fits their needs, and to help each customer achieve their biking goals. Having the correct bike for your biking needs, along with a proper fit that will make your biking experience comfortable for many years. Please come test ride a bike in a relaxed environment on the bike trail located right in front of our store.